Chios is often called myrovolos (fragrant). The port of the island heads to the East, due to the commercial links that had always existed with the ports of the East. The aromas that emerge from the citrus tree blossoms during spring fill the air. The old is harmoniously combined with the new and the trip of the senses begins. Deep, green valleys; trees descending to the sea; villages hidden among the mastich-trees. The capital, Chios, called Chora by the inhabitants, lies on the eastern coast, opposite to the coasts of ancient laconia. The Port, with its old quay, tiny multi-coloured houses, swarms of fishermen's boats and nets spread out on the mole, competes in beauty with the new pier with its modern houses abd packed cafes. From the port we see the castle opposite, which includes in its walls the old town, houses with latticed windows and balconies, Byzantine baths and the church of St George. Behind the pier lies the Archaeological Museum with remarkable collection. The Museum of Modern Greek Sculpture and the Municipal Library are also very interesting. Remains of the glorious Byzantine period are found in the numerous medieval castles, fortresses and watch towers (called vigles in the local dialect) scattered all over the island. One of the most impressive Byzantine monasteries in Greece is Nia Moni, located in the pine-covered mountains west of Chios Town. The Monastery was built in the 11th century by order of the Emperor Constantine Monomichos, who sent leading architects and the finest materials for its construction from Constantinople. The incredible gold mosaics in the church are considered to be one of the three most important examples of Byzantine religious art in Greece. The effect of sunlight or candlelight reflecting off the glistering surfaces of the mosaics, creates an indescribable atmosphere. Some of the beautiful beaches of the island are in Karfa, Daskalopetra, Lo, Pirgi, Komi, Kalamoti and Kato Fana. 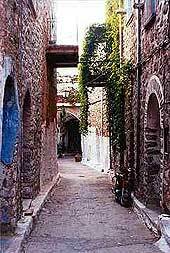 Discos, pubs, taverns with music and cinemas can be found in the City of Chios. From the capital, the road to the south leads to the Campos area full of mansions built of local stone. Among green garden and orange groves we reach the sandy Karfas beach (6 km). North of Chios lies the Vrontados village (5 km), with the famous stone "Daskalopetra" ( teacher's stone) where - according to tradition - Homer used to teach. We further reach Mersinidio monastery - en enchanting landscape overlooking the sea - the beautiful fishing villages of Pantoukios and Langada (17 km). Near the ancient Delfinion lie the two villages of Pano Kardamyla and Kato Kardamyla or Marmaro, with one of the most beautiful beaches on the island - Nago - and Ampelos coast at the end of the asphalt road. Another asphalt road to the northwest will lead us through mountainous landscapes of rare beauty to Volissos (40 km), home city of the Homer. With its coloured houses, narrow lanes, ruined Byzantine castle, the village looks as if cut out of a Byzantine fresco. There is a remarkable monastery of St George with beautiful frescoes. Two kilometres further we shall meen Limnia, a tiny picturesque fishermen's port; at the end of a long coast we reach the monastery of Santa Marcella (5 km). Again to the left from the Chora, through wondreful landscapes, we reach Nea Moni (15 km), one of the most important Byzantine monuments. Built in the 11th century by Constantine the Gladiator, endowed with marvellous frescoes and mosaic, Nea Moni remains one of the trongest Byzantine presences in Greece. Further to the west, built on the top of a hill, the villages Avgonyma and Anavatos, with their traditional homes, remind of other eras-memories of centuries gone by. The southern part of the island is most fascinating to the visitor. The monastery of Agios Minas is the first surprise. Here begins the bush. It is a bush that "weeps" a thick liquid, a white gum flowing from the bark and branches - the scented mastich of Chios, famous all over the world. As we go on, we meet villages which haven't changed since the Middle Ages. Vaulted lanes, stone houses, churches with frescoes, castles with towers and turrets suggest to the visitor a different world, painted by some weird artist. We visit Armolia, with their ceramics workshops, and reach Pyrgi, the beautiful village with specially decorated house fronts ("xysta"). 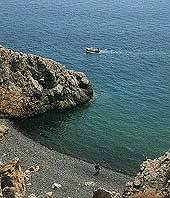 The port of the village is Emporios, a calm beach with black pebbles. Further to the west we meet Kato Fana, with a few ruins from the temple of Apollo. This is a beautiful sandy beach, port to the village of Olympoi - well known for its carnival. Finally we reach Mesta, one of the best preserved medieval villages in the area. In Pasalimani, a fishermen's village with rented rooms, one can enjoy the sea and is world of dreams.